Axwell /\ Ingrosso closed out Ultra’s main stage on Saturday night on a highly nostalgic note, pulling at their adoring crowd’s heartstrings with throwback songs such as “Don’t You Worry Child,” “Reload (which was mashed into “Starboy”)”, and “Sun Is Shining.” That said, the pair also made sure to insert some of their brand new work into the mélange of euphoric, high-charged music they were putting forth. Toward the end of their set, roughly around the 52 minute mark of the recording below, a vocal-filled ID presents itself. The new track took the willing crowd on a ride through moving guitar arrangements and ecstatic clapping samples that guided them into breakbeat-infused builds and wild, danceable drops. 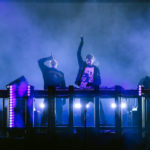 It represents the duo’s ability to incorporate past trends in dance music into a contemporary space, ultimately speaking to their timelessness as dance icons.